French Polynesia is often synonymous with romantic getaways, overwater bungalows and honeymooning couples. But, it’s also home to some spectacular diving. 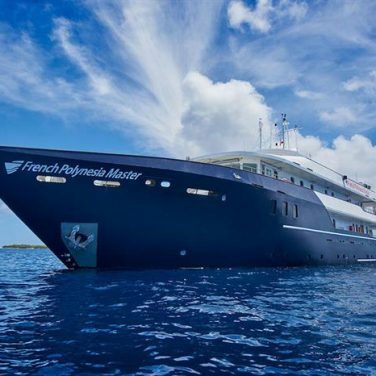 A French Polynesia liveaboard offers a taste of France in the Pacific while exploring some of the archipelago’s beautiful underwater destinations. French Polynesia is made up of 118 islands and atolls, including those with dive centers such as Bora Bora, Moorea, Huahine, Nuku Hiva and Tahiti. Whether you’re interested in wreck diving or seeing large pelagic species, scuba diving in French Polynesia has a bit of something for everyone. 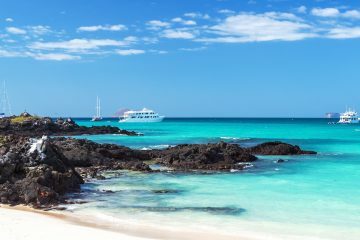 It can be hard to know where to start when choosing a liveaboard boat, especially in an area as diverse spread out as French Polynesia. Fortunately, The Adventure Junkies is here to help you with all those tough decisions about scuba diving. In this guide, we’ll show you what to look for and how to choose the best liveaboard boat. The Aqua Tiki II is a modern liveaboard boat designed for experienced scuba divers who want a private and intimate liveaboard experience. 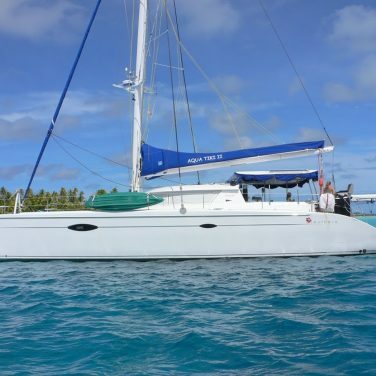 There are just five cabins and the catamaran caters for a maximum of eight divers and one non-diving guest (a total of nine), ensuring a personalized experience. 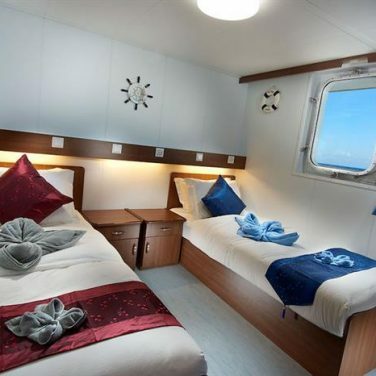 Each cabin has its own ensuite bathroom and has three hours of air-conditioning each day. There are two trampolines at the front of the cot of relaxing in the sun, a saloon with dining area, a reading lounge and shaded cockpit. Encounters can include melon-headed whales, manta rays, whale sharks and various species of fish. 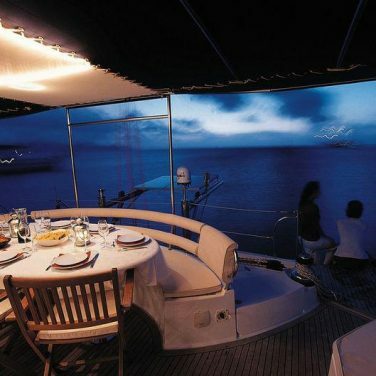 There’s also the option of night diving and high-speed drift dives for advanced scuba divers. 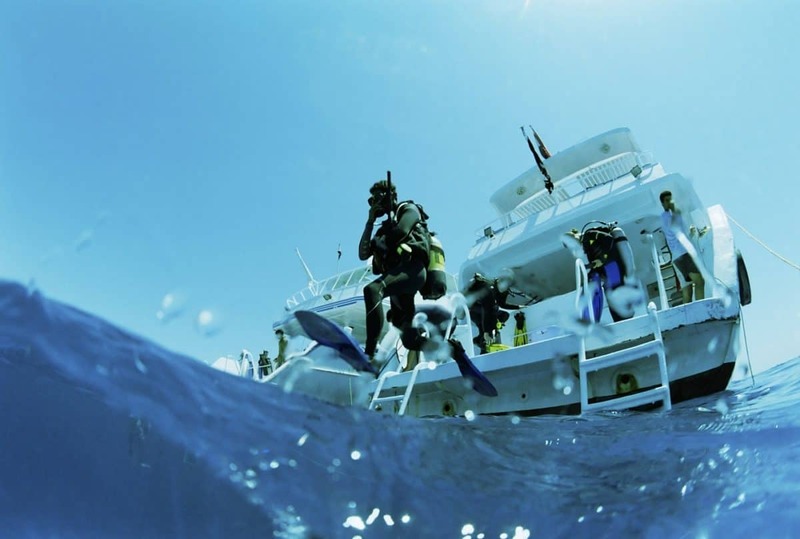 Diving is limited to twice a day and is not suitable for new or inexperienced divers. Other excursions include snorkeling, water-skiing, wake-boarding, kayaking and big game fishing. Built in 2016, the Master is a new and cozy dive liveaboard boat. There are 13 cabins on this 141ft/43m modern vessel and 12 English speaking crew to help you with every step of the journey. All rooms have private bathrooms. 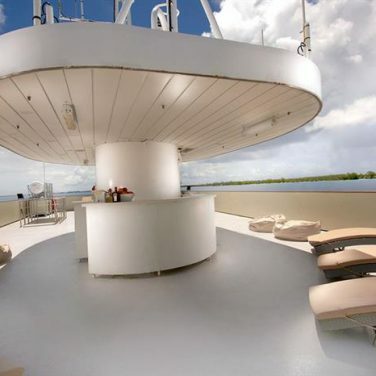 The deck has a jacuzzi for relaxing after a day underwater and there’s nitrox available for divers for a surcharge. Expect to be taken to dive sites to see a variety of different shark species including gray reef, hammerheads, black tips, silky tiger and silver tips, as well as the chance for special encounters with manta rays and bottle-nose dolphins. 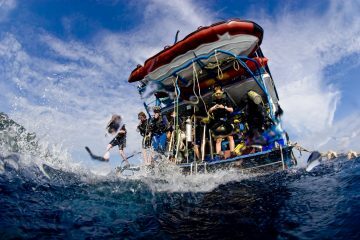 Snorkeling and land excursions are available when not diving. Dive training is available including scuba refresher, Advanced Open Water, Nitrox and other specialties. 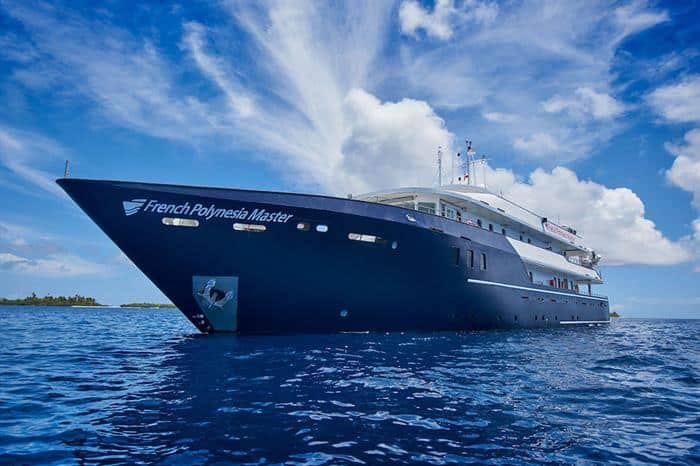 French Polynesia is known for being one of the most expensive Pacific regions to visit, so you’ll need to factor in your budget when considering a dive liveaboard. If budget is an issue, opt for a shorter liveaboard rather than a 10-night trip, which will obviously cost more. 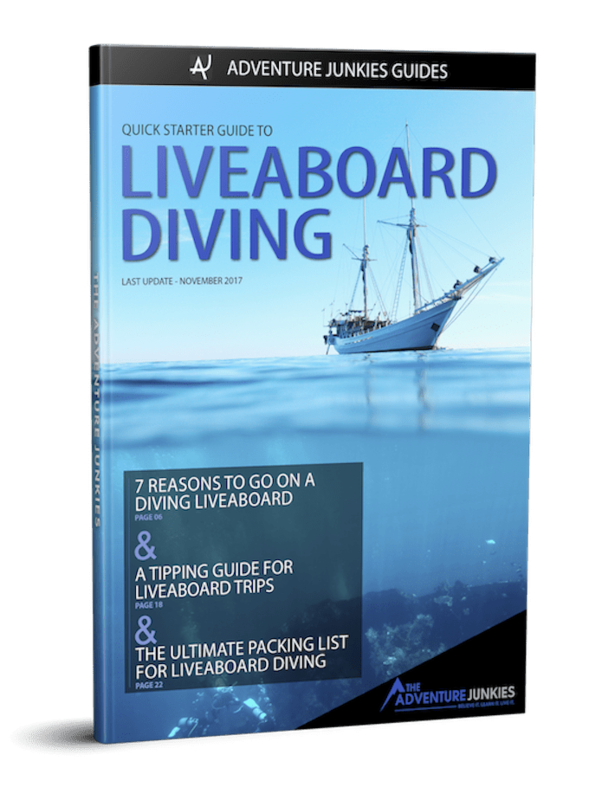 Remember that the cost of the liveaboard includes all your dive trips as well as meals, accommodation and refreshments – so while it may look like a lot upfront, it’s usually all-inclusive. Like most Pacific regions, there are two distinct seasons in French Polynesia – the wet and dry season. While diving is available year-round, peak tourist times are between May to October due to the drier weather, but this does mean pricing is at a premium. Tahiti and Her Islands rarely get hit by cyclones and typhoons, but the wet season does carry a risk nonetheless. The Tuamotu Islands, one of the more famous dive spots, are best between April and November when the seas are the calmest. The Tuamotu Archipelago is the most famous of Tahiti’s dive spots thanks to the large pelagic marine life which frequent the area. Currents around the islands mean big species such as whitetip and blacktip sharks, barracuda, tuna and bigeye jacks are likely encounters. If you want to see manta rays, then choose to dive the islands between September to December. If you want to see hammerhead sharks, dive between November and February. There are also some wreck dives including Les Trois Epaves off Tahiti and a number of high-speed drift dives, which are likely to bring about encounters with larger species such as schools of sharks and manta rays. These passes are recommended for advanced scuba divers only. 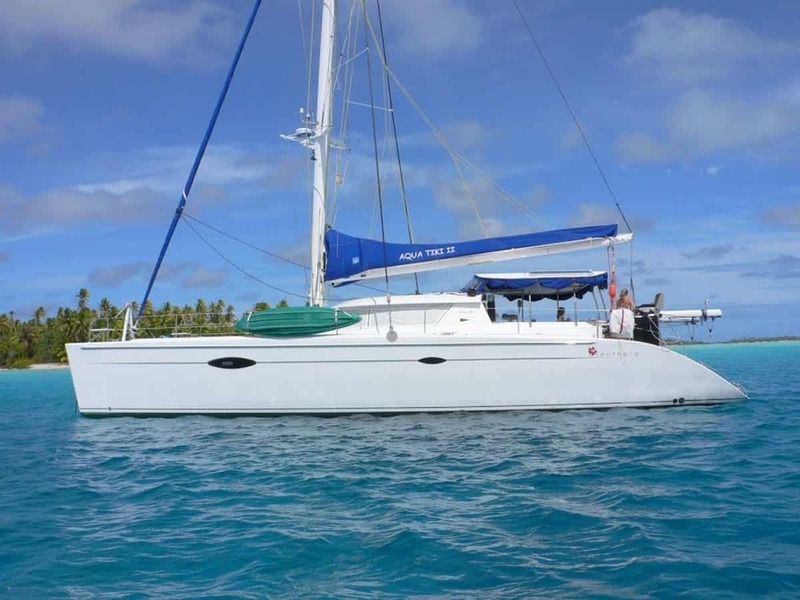 There are two dive liveaboards servicing French Polynesia, but one specifically caters to experienced scuba divers. If you haven’t been diving for a while, you might want to choose a liveaboard boat which offers a Scuba Refresher course to ensure you make the most of your trip and refresh your skills and knowledge. Both boats offer the Advanced Open Water Diver certification. You may also need to consider whether nitrox diving is available. The liveaboard boats in French Polynesia work through different agencies with their dive education. One offers PADI certification and the other is CMAS. 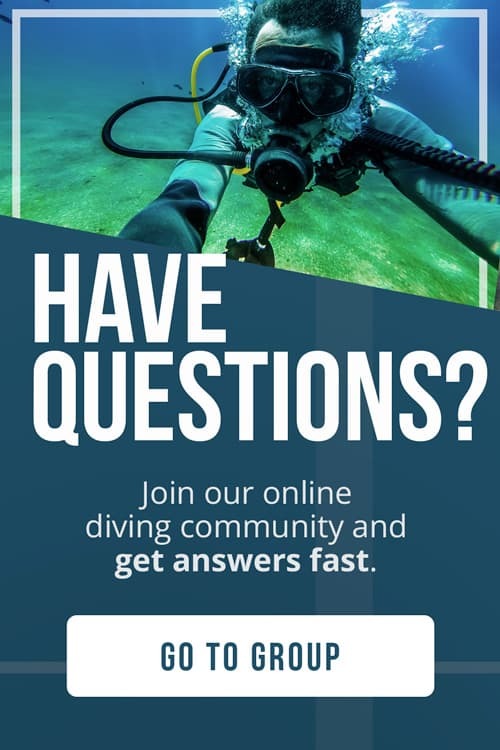 If you plan to advance your diving but want to stick with a particular agency, then you’ll need to consider which boat works with your preferred dive training company. 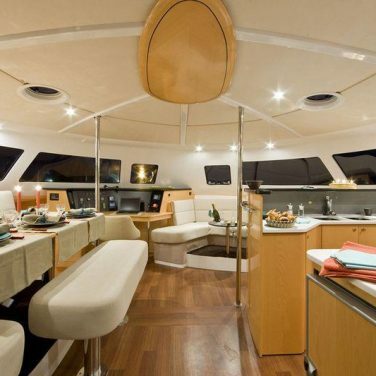 You may want a particular style of boat that has a spacious dive deck and charging stations. Consider the features of each boat and whether they will suit your needs. This is particularly important for underwater photographers and videographers, who often need more space to clean their gear with fresh water and to safely store them when out of use.